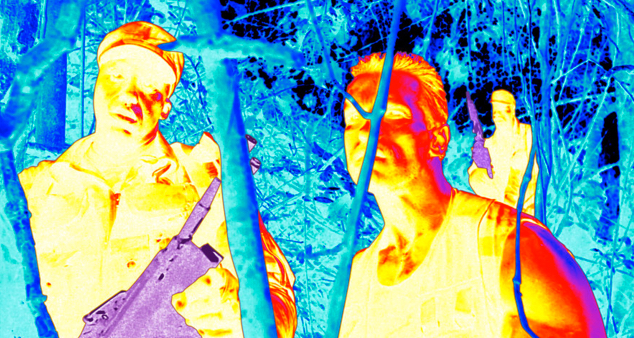 In the 1987 movie “Predator,” an alien who sees in the far thermal infrared region of the spectrum hunts down Arnold Schwarzenegger and his team — introducing a generation of science-fiction fans to thermal imaging. The ability of humans (or aliens) to see in the infrared allows military, police, firefighters, and others to do their jobs successfully at night and in smoky conditions. It also helps manufacturers and building inspectors identify overheating equipment or circuits. But currently, many of these systems require cryogenic cooling to filter out background radiation, or “noise,” to create a reliable image. That complicates the design and adds to the cost and the unit’s bulkiness and rigidity. This work was reported in ACS journal Nano Letters. It has been supported in part by MIT/Army Institute for Soldier Nanotechnologies, Army Research Laboratories, Office of Naval Research GATE-MURI program, Solid State Solar Energy Conversion Center (S3TEC), MIT Center for Integrated Circuits and Systems, and Air Force Office of Scientific Research. UPDATE Nov. 6, 2015: corrected wording to clarify that the device operates in the mid-infrared, not far-infrared range. In this work, we leverage graphene’s unique tunable Seebeck coefficient for the demonstration of a graphene-based thermal imaging system. 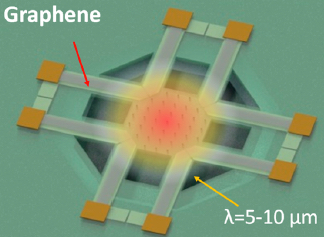 By integrating graphene based photothermo-electric detectors with micromachined silicon nitride membranes, we are able to achieve room temperature responsivities on the order of ∼7–9 V/W (at λ = 10.6 μm), with a time constant of ∼23 ms. The large responsivities, due to the combination of thermal isolation and broadband infrared absorption from the underlying SiN membrane, have enabled detection as well as stand-off imaging of an incoherent blackbody target (300–500 K). By comparing the fundamental achievable performance of these graphene-based thermopiles with standard thermocouple materials, we extrapolate that graphene’s high carrier mobility can enable improved performances with respect to two main figures of merit for infrared detectors: detectivity (>8 × 108 cm Hz1/2 W–1) and noise equivalent temperature difference (<100 mK). Furthermore, even average graphene carrier mobility (<1000 cm2 V–1 s–1) is still sufficient to detect the emitted thermal radiation from a human target.